Services info/forms and contact us here! Your pet is our top priority at Angel's with Furry Souls and whether we are pet sitting, doing doggy day care or cage free boarding, your 'best friend' is treated with all the respect and love all animals deserve! We also realize that dogs come in all shapes and sizes and more importantly, personalities. With us, you have the option of having your dog be part of the pack and play with other dogs that are well socialized. Or, if your dog prefers his own company and would be more comfortable with human companionship alone, that's fine too. We are okay with dogs that 'Don't play well with others'. Please let me know if your dog is unaltered, not spayed or neutered. We live in the country, so plenty of fresh air and sunshine and walks in the woods are normal, everyday routine. Rides in the car are also available, visits to the town park to chill with the locals, Pet related TV shows, filled Kongs, Frosty Paws and home baked, all natural treats are just a few of the things that go on everyday at Angel's with Furry Souls. Let's not forget that kitties, bunnies, horses and all other types of animals have a niche with us as well. Whatever your pet, Angel's with Furry Souls can provide care. Check out the services available below, and if there is something you need that's not on the list, just ask and we'll see what we can do. We look forward to seeing you and your pet soon! PET SITTING: Periodic visits can be scheduled throughout the day, to make sure that your kid doesn't miss a meal, gets plenty of fresh water, receives any necessary medication, goes for walks, plays, is gently brushed and showered with affection. In addition, mail can be brought in and the security of your home checked. A report can be left after each visit. Each visit lasts thirty minutes or so, depending on your pets needs. Rate-$15 for 30 minutes, within 8 miles of our location. If you live outside that area, rate will be $20 per visit. DAYCARE: Safe, secure play yard with doggie pool, in season. Indoor play, walks and all around fun. Rate-$20 for under 6 hrs, per dog. More than 6 hrs., is $25. More time available on request too. You can also request PRIVATE daycare, for those pets who prefer human companionship to that of other canines. PET TAXI/TRANSPORT: Safe insured transport of your pet to desired destination-like Vets or groomers, will stay with your pet during visit and then return your buddy safely home. Rate-$30 for 1 to 1 1/2 hrs time, up to 15 miles. After that, $20 per hour and .50 cents per mile. SECURITY CHECK: Just want your home checked while away? Doors, windows, mail, lights and more. Rate-$15/up to 30 minutes and within 15 miles. PET FOOD/MEDICATION DELIVERY: Just call to have us pick up what you need. Rate in addition to cost of supplies. Rate-$15/ up to 30 minutes and within 15 miles. Combine a quick pick up of food or meds with a scheduled pet sit and the delivery is free. ECO-BATH: Basic dog bath, which includes a traditional brush out and blow dry. (If you pet is really tangled, it could cost more.) We believe that having your dog clean is important and shouldn't cost a fortune. Rate-$10/small dog; $15/medium size dog; $20/large size dog. Book a bath with a daycare or boarding and save $5 on the bath! BED & BISCUIT SLEEPOVER/ other-wise known as CAGE-FREE BOARDING (Limited availability): With outdoor secure play yard, agility and doggy pool (in season), TV, music, A/C, sofa, cozy crate (if they like) and full bed privileges with sleeping buddy. Walks and treats included, with lots of love as a bonus. It's preferred that you bring your pets own food, favorite toy and anything else that would make them comfortable. We don't have kennels here, your pets stay in rooms with us, so space is limited. Rate-NOTE NEW PRICING: $35 per day for one dog. (Not 24 hours, per day). THIS PRICE IS THE SAME SINCE 2011.​ 2 dogs from the same family, same room for $50. We DO accept puppies, even real young ones, for a small additional charge. They are more care, more clean-up and such. ​Rates for puppies varies, depending on the breed of dog. Typically, under 8-12 months is considered a puppy here, but it's determined on a case-by-case basis. Some dogs take longer to grow up. The rate for a puppy is $50 per day, if you book a second dog with a pup, then it's $65, so long as they can share the same room. We will review your pup prior to boarding so you know what the expense will be. PET HOSPICE & PALLIATIVE CARE: Are you in need of emotional or physical support through your pets illness? Consider adding palliative care coordination between you, your Vet, your Pet Sitter, your Pet Hospital and your Pet Chaplain. Hospice visits and care for your pet also available at reasonable rates and end-of-life support and assistance. Just call for more info. ​ADOPTION ASSISTANCE: Sometimes it's as simple as I know of animal up for adoption, being surrendered by its owners and I put you in touch. That ends my involvement you take it from there. Call for more info. EMERGENCY PET CARE: We can offer a wide variety of emergency pet care services. For example, you are forced to move, cannot take your pet with you. If we have the space, we can board your pet until it is placed in a shelter if necessary. If you pet needs transport to a safe place we can do that. Do you need to have your pet taken to the vet and can't drive yourself? What ever the emergency, just call to discuss your situation and we'll do what we can to help. Effective March 1, 2019, Angel's with Furry Souls rates for Cage Free Boarding will be changing. This is the first major price increase since 2011. The charge for one dog will stay the same at $35 per day (not 24 hrs), the rate for two dogs will now be $50. Rates for puppies will be $50 per day, add a second dog (not puppy) and the rate is $65 per day. We are committed to providing the best, most personalized pet care services in the Burke area and are happy to have your pets as part of the Angel's with Furry Souls family. Rates for pet sitting services are for 1-2 dogs or up to 4 cats, so if you have more pets than that, please consider booking more time so that your pet feels lots of love and attention. Please inform us ahead of time if your dog is an unaltered male or female as special accommodations must be made for these pets! 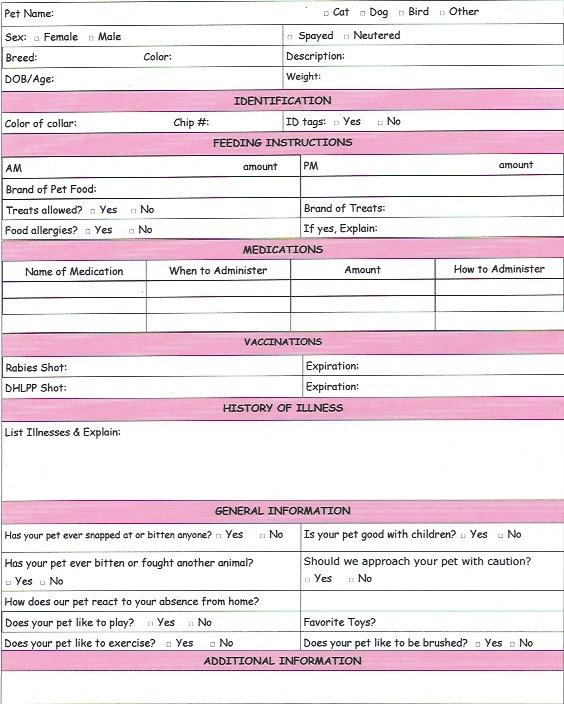 Downloadable forms to expedite your application for services. 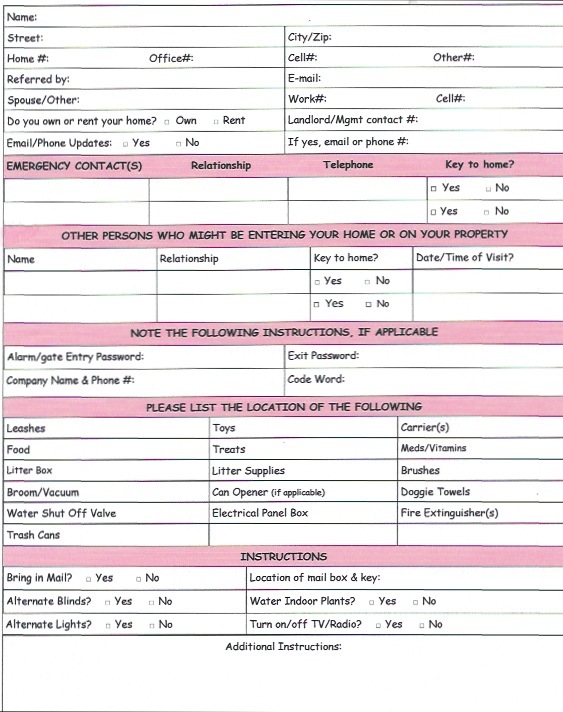 Fill out those relevant to your own unique situation.